Phil Kessel went under the Rocket's Red Glare microscope in mid-November when he was leading the NHL in both goals and total scoring. Rocket concluded that it wouldn't last. Was he correct? Well, it depends on how you look at it. 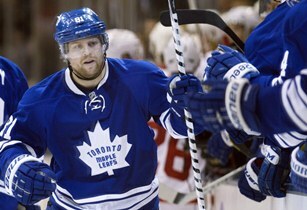 Phil Kessel led all former Gophers with 82 points (37g-45a) in 82 games. He was the highest-scoring U.S.-born player in the NHL with a career-high 82 points, and Kessel was the highest-scoring Gopher since Neal Broten had 85 points in the 1989-90 season. His 82 points also paced the 301 former college hockey players who suited up in an NHL game this year. It was a pretty nice year for ex-Gophers all around. Blake Wheeler (T-41) and Thomas Vanek (T-49) were also among the NHL leaders in points. Nick Leddy, Alex Goligoski and Erik Johnson were among the top 60 point-scoring defensemen in the league. Even Kyle Okposo had a 24-goal season -- must have been in spite of Don Lucia, eh -- just like all the rest of those top players. Tuesday (Hiring Barry Bonds) edition: Wha' Happened?